The National Aeronautics and Space Administration's (NASA's) Parker Solar probe has successfully completed its second approach to the Sun which brought it closest to the Sun. The manoeuvre, called a perihelion, resulted in the closest approach on April 4. The spacecraft was about 24 million km above the surface of the Sun. Parker Solar Probe was travelling at 2,13,200 miles per hour during this perihelion and is now entering the outbound phase of its second solar orbit. Scientists are looking forward to getting the science data down from this encounter in the coming weeks so the science teams can continue to explore the mysteries of the corona and the Sun. Launched on August 12, 2018, the Parker Solar Probe, NASA's historic small car-sized probe, will make a steady journey to come closer to the Sun until it makes its closest approach at 3.8 million miles. Throughout its mission, the probe will make six more Venus gravity assists and 24 total passes by the Sun. The spacecraft in January completed its first orbit of the Sun, reaching the point in its orbit farthest from our star, called aphelion. For the second perihelion, the Probe began the solar encounter on March 30, and it will conclude on April 10. The solar encounter phase is roughly defined as when the spacecraft is within 0.25 AU- or 23,250,000 miles- of the Sun. One AU, or astronomical unit, is about 93 million miles, the average distance from the Sun to Earth. The Sun may be granting us life but it also has the power to play havoc with spacecraft in orbit, and communications and electronics on Earth. Q. 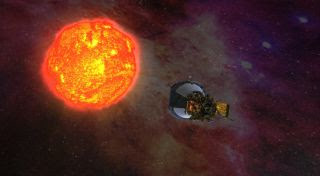 Which Solar probe of NASA has successfully completed its second approach to the Sun which brought it closest to the Sun?